This is one of those books I keep telling myself I must read and I think one of the reasons I haven’t is because it’s described as a detective novel – and yet, I expect I’d enjoy it if I did sit down to read it. You probably would- but it will be a VERY long sit! 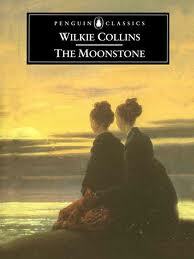 I love this book, almost more, I think, than ‘The Woman in White’ which is usually said to be his masterpiece. Have you read ‘The Suspicions of Mr Whicher’ by Kate Summerscale? It is about a real life case which clearly influenced Collins on many respects while he was writing ‘The Moonstone’ and well worth looking at if you’re going to discuss his novel.